For those of you who missed the announcement at the Brewery, once again, some serious health woes have sidelined me indefinitely for the foreseeable future. Both my heart and gallbladder are on the fritz, and since the latter might be causing the former, after a month and a half of chasing referrals and non-diagnosis, it is scheduled to be removed this coming week. 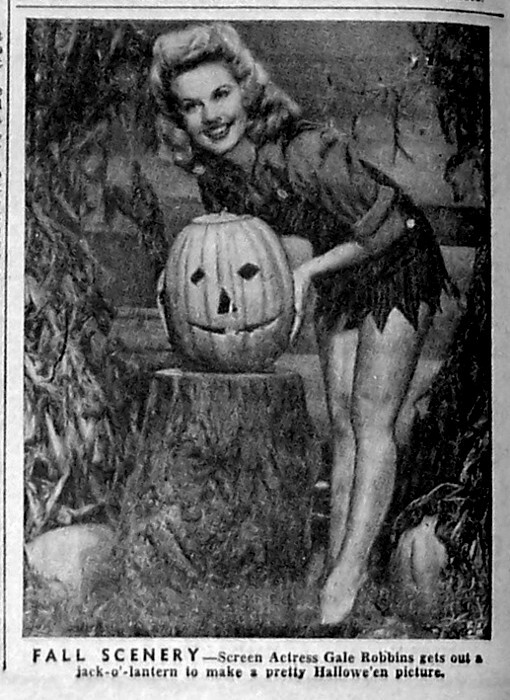 Thus and so, Boils and Ghouls, I have a few holiday specific ads that I’d been stockpiling the past few months that I will get posted today. After that, the Morgue will once more go into hibernation until this medical crisis is resolved. Thanks for listening, thanks for viewing, and, as always, stay cool, one and all. Shields Up! There’s a Blogathon on the Starboard Bow! Set Phasers on Post! 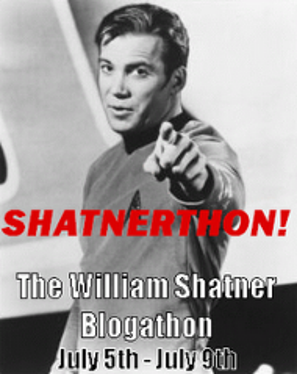 :: The William Shatner Blogathon!. Way back in June of 2010, the fine folk behind the magnificent She Blogged by Night held The Shatnerthon!, a tribute to the great William Tiberius Shatner. Scenes from the Morgue heeded the call and participated back then, and now, to celebrate Wild Bill’s birthday this weekend, it was high time we migrated those ads over to the new site plus a few more treats mixed in. Enjoy. 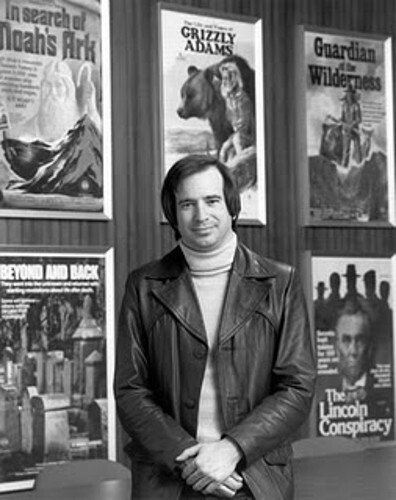 The Truth is Out There :: The Cryptic Cinema of Charles Sellier Jr.
One of the quieter patron saints of schlock cinema, Charles E. Sellier Jr. was kinda of a throwback to the old barnstorming and roadshow days of Dwain Esper and Kroger Babb. 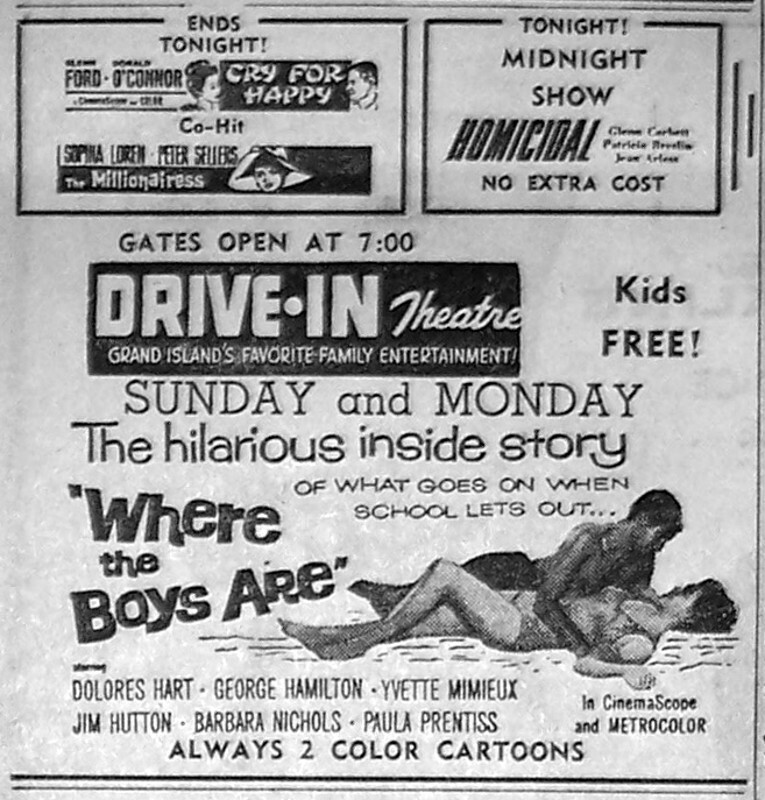 Probably best known to the masses for the ruination of Christmas with his controversial but, in the end, harmless holiday slasher, Silent Night, Deadly Night, but we children of the 1970s remember him more for his rash of crypto-zoological, strange phenomenon, and eccentric historical docudramas, where Brad Crandall or Peter Graves would guide us on a tour of the inexplicably unexplained with the likes of Beyond and Back, The Mysterious Monsters, The Bermuda Triangle, In Search of Noah’s Ark and Hangar 18. 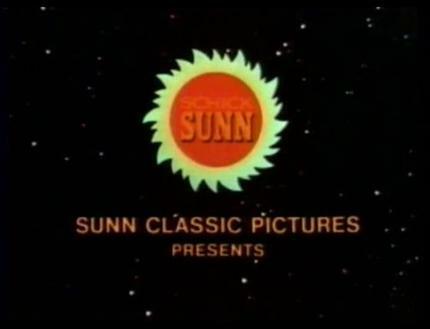 Back in the day, through his Sunn Classics productions, the producer would wrap a film and then hit the road and 4-Wall them around the country, where they would wind up at your local theater for one week, and one week only, maybe two. Yeah, to say Sellier Jr. was a bit obsessive on the mysterious and unexplained would be a bit of an understatement. 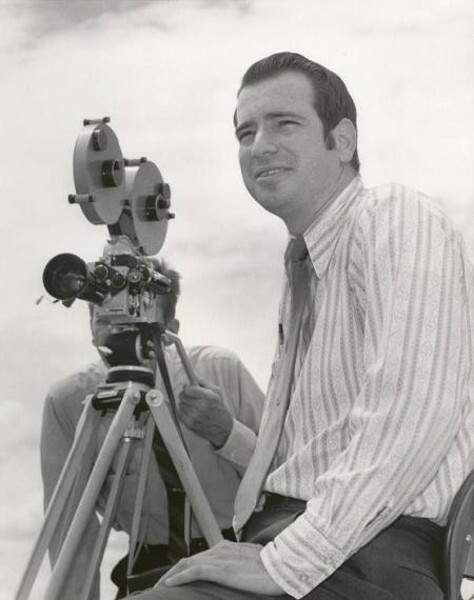 He found a kindred spirit in director and scriptwriter Robert Guenette, who oversaw half of these films already mentioned and also guided The Unexplained: The UFO Connection and The Man Who Saw Tomorrow to the big screen. They just don’t make ’em like that anymore. *sigh* And so, please enjoy this tribute to the man and his movies. 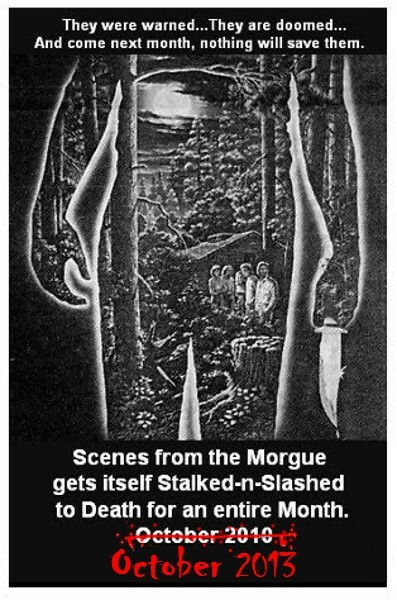 Stalk ‘n’ SlashCinema :: Post Them, Mommy. Post Them! Hello, October. Nice to see ya. What’s it been? A year? 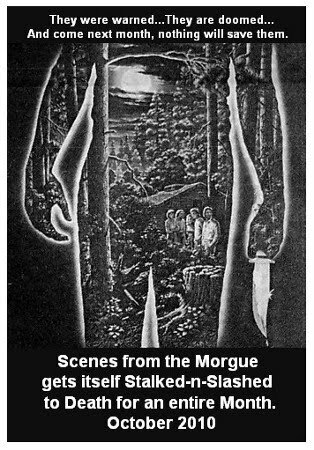 OK, Boils and Ghouls, grab your favorite gardening implement or kitchen utensil and sharpen up those blades, because we’re celebrating the Hallowe’en season by kicking off a three week tribute to Stalk ‘n’ SlashCinema before polishing off the month with another batch of Midnight Spookshow ads. Stay tuned, we’ll be right *thwack*. School’s Back In, and so, I Am Outta Here! For those unfamiliar with my routine, here’s the dope: Every year since I started face-planting on my keyboard and posting the resulting gibberish, I’ve taken the month of September off; a sabbatical, if you will, to let my nose heal up properly before hammering away again for the rest of the year. But, before I go, I will leave you all with a couple of clues of what’s coming up when we return in October. 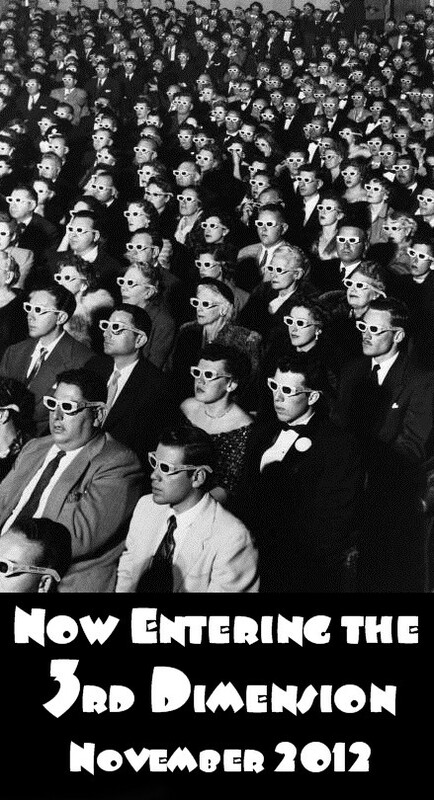 Announcements :: For the Love of Film Noir All Over Again! 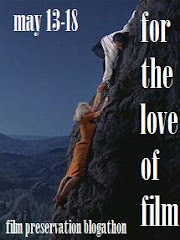 Alas, that beautiful banner is from a long extinct Blogathon. However, for most of March Scenes from the Morgue will be heading down the rain-soaked streets and neon-drenched back alleys of Noirville again. 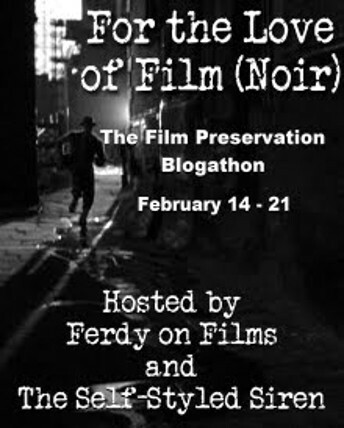 And though we will be rehashing all the material originally published at the old site for the very same For the Love of Film Noir fund drive from 2011, we’ll also be scattering around a lot of new stuff as well. Also of note, we’ll be posting them in chronological order to show how the genre evolved and progressed from the 1940’s through the late ’50s. So, grab your gasser, make all the wrong choices, watch helplessly as all your best-laid plans disintegrate from the inside out, fall for the wrong guy or gal, and then try not to get stabbed in the back or framed-up for any murders, meaning, peruse at your own risk! Stay down and stay tuned, folks! Time to Break Out those Glasses! That’s right, folks. For the whole month of November, the Morgue is donning our cardboard frames and gels and going 3-D! Our first batch of Stereo-Scopic ads will be posted in the next couple of days. Some we posted at the old blog, sure, but this time the content will be all inclusive and in chronological order as I find ’em in groups of — what else? — three as we trace this cinematic phenomenon through the mid-1950’s, where it flashed big and bright but burnt out all too quickly. Stay tuned, Boils and Ghouls!